Ten Speed Press, 9781607746874, 304pp. From the acclaimed chef Ashley Christensen comes a bold and revelatory reinvention of Southern food, as told through the recipes and stories from her iconic and beloved restaurant, Poole’s Diner. ASHLEY CHRISTENSEN is the chef and owner of seven restaurants—Poole’s Diner, Beasley’s Chicken + Honey, Chuck’s, Fox Liquor Bar, Joule Coffee & Table, Death & Taxes, and Bridge Club—all located in downtown Raleigh, North Carolina. Ashley’s cooking and her philosophy of bright, fresh flavors and locally grown, seasonal ingredients have garnered local and national acclaim. Ashley is involved in a number of charities, including the Frankie Lemmon Foundation, the Southern Foodways Alliance, and Share Our Strength. In 2014, Ashley was awarded the James Beard Award for Best Chef Southeast. "The first two snacks, among the more than 100 recipes in this collection, are misleading: pimento cheese followed by deviled eggs might cause readers to think that this is another tome featuring good old Southern comfort food classics. But the James Beard Award–winning chef Christensen, owner of Poole’s and six other eateries in Raleigh, N.C., quickly reverses course, steering head-on into the wilds of modern cuisine with fried eggplant with burnt honey aioli, and turnip green fritters with whipped tahini. Dynamic flavor and texture combinations highlight the salad section, which includes tangy options such as heirloom tomatoes with crushed olives, crispy quinoa, and white anchovy dressing. The vast breadth of a diner menu perhaps explains why a standard recipe for potato latkes turns up in the vegetable chapter, though they would certainly go well as an accompaniment to the Poole’s steak, simply seasoned and served with a red wine pan sauce. Meanwhile, in his many full-color photos, Asheville photographer Johnny Autry shows a subtle appreciation for utensils: a thin knife tangential to a tomato pie, a school of seafood forks beside a bowl of mussels, and spoons and forks immersed in pork and dumplings." "Chef Ashley Christensen revived Raleigh, NC's historic Poole's Diner in 2007, putting a modern, approachable spin on Southern classics. The simple, often whimsical, dishes in Poole's dazzle." "Raleigh's empire builder extraordinaire Ashley Christensen makes her cookbook debut, fittingly, with a chronicle of her very first restaurant, the acclaimed Poole's Diner. Expect recipes for gussied up Southern favorites and diner staples, whether pimento cheese, macaroni "au gratin," or for the gorgeous cover dish of watermelon, avocado, goat cheese, basil, and a sweet onion vinaigrette. Southern food lovers and restaurant obsessives alike will be eagerly awaiting this one." "Christensen’s Southern restaurant empire runs seven deep, but at each additional restaurant, she doesn’t let up on her commitment to local ingredients and Raleigh, North Carolina, appreciation. Her recipes, like the lively Poole’s Diner itself, exude comfort and warmth. Which you’ll find in the versatile chow chow, cornmeal-fried okra and dark chocolate pecan pie." "If you’re looking for inventive dishes and unique flavor combinations, then reach for Ashley Christensen’s bold recipes. Her modern take on Southern food honors the traditional meals while incorporating new ingredients that take the flavors to a whole new level. Delight the senses with turnip green fritters with whipped tahini and warm broccoli salad with cheddar and bacon vinaigrette. It’s a beautiful collection." "Fine recipes that blend traditional Southern cooking with innovative twists, including dishes like turnip green fritters with whipped tahini, bread pudding made with challah, whiskey, apples, and creme fraiche, and her famous pimento cheese, inspired by her grand-godmother’s original. With personal vignettes about opening the restaurant—a milestone that effectively help set off a culinary renaissance in the city—Poole’s is more than a cookbook; it’s a story of creating a vibrant community around fresh food." "Since making Raleigh, North Carolina, her home, chef Ashley Christensen has opened multiple restaurants there, but Poole's Diner was her first back in 2007. I've not had the pleasure of dining at Poole's, one of the South's most celebrated restaurants, but the cookbook has me wanting to try every single recipe in it. Part of Christensen's genius is starting with homey fare that we can all relate to and then elevating it to make it sound (and taste) better still." "Christensen is a North Carolina native, and her recipes paint a portrait of a hip, modern South." "Most cookbooks fall into one of two categories: the aspirational and the useful, those that are flipped through on lazy Sundays, then returned to the top shelf, and those that live a dog-eared life on the counter. 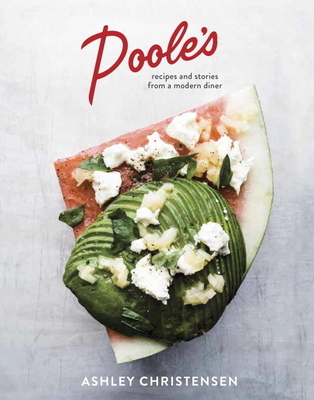 With Poole’s: Recipes and Stories from a Modern Diner, Ashley Christensen has written the rare cookbook that begs to be labeled as both." "[Poole's] pulls the cooking and ethos of Christensen’s diner, providing recipe after recipe for Southern comfort food. The book presents at a much higher level than you might expect, with the gorgeous photography and glossy pages of a fine dining restaurant cookbook. The incommensurateness works well: We quickly understand that though this is a diner in the South, the techniques and ingredients are first-rate, that Christensen’s recipe for cornmeal-fried okra with Tabasco mayo, say, or pork ribs with mustard sorghum sauce, requires the same honesty and care as any dish coming out of any classic French kitchen, New York bistro or L.A. farm-to-table restaurant."